I'll first address the obvious; New Jersey is very close and Virginia isn't. 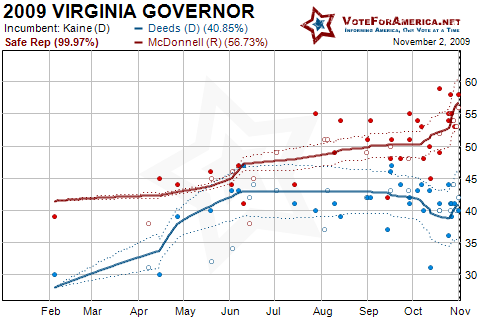 McDonnell (R) could win by 20% while Corzine (D) or Christie (R) could win by 20 votes. There is no automatic recount in New Jersey, but any candidate can request a recount within 15 days of the election. Despite what candidate Chris Daggett is claiming, I have never contacted him or his campaign. I have never asked him to drop out of the NJ Governor's race. Now, if a politician is going to play loose with facts like this, the electorate needs to know it. So, to the good people of New Jersey, please know that Daggett's claims are false. I?ve never even suggested he should drop out of the race. But, come to think of it? Nobody inclined to vote for Daggett (I) gives two shits what Palin thinks, about anything. In fact her innuendo, for Dagget to drop out, would definitely not help Christie. 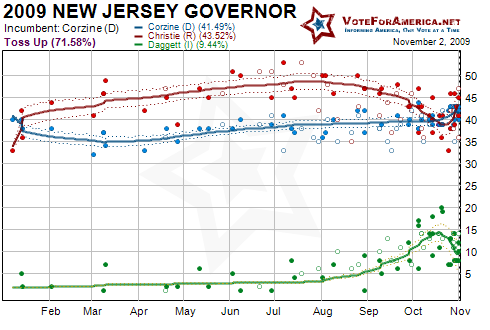 The most recent Quinnipiac University poll of New Jersey asked which second candidate Daggett voter's preferred; Corzine led by 10%, 39 to 29. Another recent poll by Public Policy Polling (D) made the same determination. Daggett is helping Christie at this point, but Palin is too stupid to realize this. Obama also campaigned for Corzine over the weekend. The cover of today's New York Times prominently displayed Obama and Corzine in a traditional rally pose. This is definitely positive exposure for Corzine and could translate into votes, although New Jersey does not have same day registration. Corzine clearly won the fundrace, but will it translate to a victory tomorrow evening? I'm waiting until tomorrow to post the final projections as there are likely polls in the field today that will be released tomorrow. I'll have updated graphs, as well as my final thoughts before the polls close tomorrow at 8 PM ET in New Jersey and 7 PM ET in Virginia. There are also a number of other elections tomorrow with intriguing ramifications. There are two elections to fill US House vacancies, CA-10 and NY-23. NY-23 is a Republican district with three two major candidates after the moderate Republican withdrew and endorsed the Democratic candidate to spite the National Republican Party. CA-10 is a solidly Democratic district with a PVI of D+11; this distinct will be won by Democrat Lt Gov. John Garamendi. A number of other states also have referendums and propositions on the ballot.